More Grumbine Science: What cooling trend? Nonsense about the 'current cooling trend' is rife across the blogosphere, and the science minded folks usually point to the fact that you need 20-30 years to define a climate trend. The lies as such don't interest me, or make for a good topic for this blog. What's useful or interesting is that the statement itself, often linked to 'last 10 years', is not true even after allowing for substantial cherry picking. This brings us back to the interesting matter of trying to define climate. And a further reminder that if you're reading bad sources, you can't trust even the simplest of statements. To find current temperature trends, I used the NCDC monthly temperature anomalies. The most recent month is May, 2009. To look in to current trends, then, I computed the trends from every month of the last 30 years, through to May 2009. 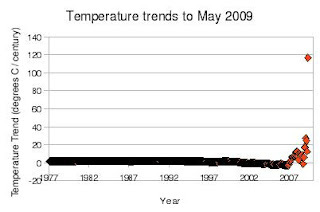 The trend shown for January 1979 is the trend from then to May 2009. 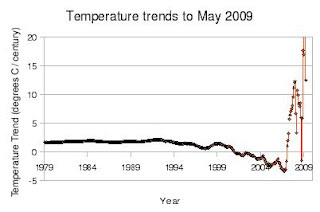 The trend for April 2009 is to May 2009. Figure 1 gives the results (actually back to 1977). Wow, current warming trend of 120 C per century! Surely we're all going to be boiling soon? Of course not. That trend was computed from a 1 month span -- April to May of 2009. It is yet another reminder that short term variations, namely weather, can be large. It isn't climate. Climate shouldn't depend sensitively on when exactly you start your trend computation. Unfortunately that figure shows us nothing new, beyond confirming yet again (not a bad process itself, and part of the scientific approach) that weather happens, and weather variability is much larger than climate variability. So in figure 2, I zoom in a little and ignore positive trends greater than 20 C/century. So now we can see that if someone chooses very carefully (namely, cherry picks) the starting date, they can find a cooling trend between then and May 2009 ('current'). But notice how carefully they have to choose that starting date. If it's 10 years (or any number greater than that, back to the record's start date), the trend is a warming. In fact, you can only get cooling trends occur if you choose a start date between January 2001 and January 2007 (including those months), or October, 2008. Anything farther back, or more recent, shows warming. Both for deciding climate, and for doing science, we want our conclusions not to depend sensitively on arbitrary choices. Ending with the most recent data is not arbitrary, so we're ok there. But choosing a starting date? Science-minded folks take a figure in the range of 20-30 years, in particular 30, because over a century of experience says that 30 years is a good time period to be able to look at climate trends as opposed to weather fluctuations. i.e., not arbitrary. Choosing 2.4-8.4 years (and not 9.4, or 12, ...)? Why would we do that? Well, if we wanted to support some particular conclusion, we might do so. But that is not science. Let's zoom our attention to the period in late 2006 through early 2007. The largest 'cooling trend' you can contrive is to start with September or October 2006, giving 3.3 C per century cooling. Of course you're flagrantly violating sensible climate practice by using 30 months instead of 30 years. But now look to April 2007, where the trend is already a warming of 3.3 C/century, and remains higher than 3.3 to the present, except for that 1 month, October 2008. If 30 months are ok for cherry pickers, why are 24 months not? They're not very different time periods; if either one is acceptable, both must be. On the science side, as my results post illustrated, if you take 20-30 years to determine your trends, then changing the length doesn't change your answer much. We see this again in figure 2, where any trend computed with from 15-30 years of data gives nearly the same answer as to the current trend -- about 1.8 C per century (1.49 for 15 years, 1.79 for 20, 1.92 for 25, and 1.62 for 30 years). The figures do fluctuate some, which is to be expected. But changing from 30 to 24 years doesn't take us from a large cooling to an equally large warming, the way it can for months. I'll probably take this up in a separate note, as it illustrates a different way of misleading yourself with graphs. For now, I'll just observe that if you compute the 10 year trends, rather than telling people to 'just look', then the most recent time there was a 10 year cooling trend was the 10 years ending with January, 1987 (with 0.03 C/century). The last time you had several months in a row where the 10 year trend to that month was a cooling was in the late 1970s -- 30 years and more back. At no time that the '10 year cooling trend' claim has been getting made, has it been true. Excellent post. Perhaps the best discussion of this topic, at the layman's level, that I've yet seen. Very clear and simple as to why you need a certain number of data points to arrive at a meaningful representation. It reminds me of the Representative Elemental Volume used by hydrogeologists in groundwater flow (fluid flow through porous media). The REV is the appropriate sample size required to accurately represent the media as homogenous for a particular parameter and problem (in groundwater flow, typically hydraulic conductivity or porosity). For a small sample size (or area or volume), you may have "wild fluctuations" in the parameter of interest (e.g., in groundwater flow, small sample volume may be influence by one or more large pores, voids, or aggregate, causing porosity to be unusually great or little in relation to the volume selected). As the sample size passes the REV, however, variation in the parameter of interest converges to a stable value (until, in hydrogeologic problems, the value may diverge or trend to a new value - indicating a sample size that is now so large as to include, and evidence, true spatial variability). I applied this concept to some geotechnical sampling and analyses I completed for my master's degree, and the engineering professors rather ate that up, as it were. It seems to me to be a similar concept here in climatology - how many temporal data points do you need to have a "representative" timeframe, and as you let that time extend further, until you are incorporating historical trends, I would assume you'd get steady changes to different values. But for the purposes of understanding climate, in this sense, your Representative Elemental Volume for global temperature trend, as you just demonstrated, would be on the order of 15 to 30 years. Very nice illustration of the problem with short term "trends". This comment is months late, but I have only discovered your excellent blog today. As a geologist with some background in the geochemistry of mineral deposits, I would note that the concept of a proper scale for statisically valid sampling should be familiar to anyone with experience in the mining industry. Sampling too small a volume or rock will give widely varying results that are dominated by "nuggets". Sampling too large a volume will dilute the ore, but is nonetheless an essential calculation to determine the economics of a potential mine. I therefore find it very odd that a certain high-profile AGW skeptic with an extensive background in the mining industry continues to use inappropriate sampling sizes when it comes to his "audits" of temperature records! Welcome Mike. Never too late to add a good thought. Mining is far from my experience, so I appreciate your example. Yet another field that has arrived at a similar principle.